Forum member Django Li has confirmed that the forthcoming FilmArt releases of Umberto Lenzi’s poliziotteschi classics THE CYNIC, THE RAT AND THE FIST and BROTHERS TILL WE DIE will include newly commissioned interviews with the director as well as Sal Borghese, Henry Silva and composer Franco Micalizzi. The fledgling German DVD distributor has yet to set a date for either title but their debut will mark the first time that the films have been given an official, English-friendly DVD release. 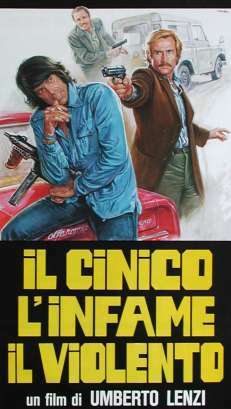 THE CYNIC, THE RAT AND THE FIST (Il cinico, l’infame, il violento) is top tier Italian crime, featuring the unbeatable triptych of Maurizio Merli, Tomas Milian and John Saxon. BROTHERS TILL WE DIE (La banda del gobbo), co-written by Milian and director Lenzi, sees the actor take on the dual role of two brothers opposite Henry Silva. This entry was posted in Interesting, News and tagged brothers till we die, dvd, filmart, franco micalizzi, henry silva, Il cinico, il violento, italian crime, l'infame, La banda del gobo), Maurizio merli, poliotteschi, Poliziotteschi, sal borghese, the cynic the rat and the fist, Tomas Milian, Umberto Lenzi by Paul. Bookmark the permalink.